Prominent & Leading Wholesale Distributor from Pune, we offer honeywell electrosoft gloves class-00, honeywell electrosoft gloves class-1 and honeywell electrosoft gloves class-0. • Comfort - Its ergonomic shape and lightly powdered interior make the glove easy to slip on and off. • Resistance: Its natural latex base offers high dielectric characteristics. Its thickness (0.5 mm) ensures good dexterity while offering protection up to 500 volts of use. 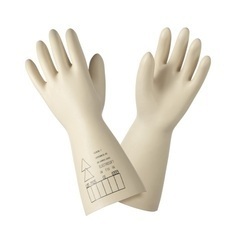 · Comfort - Its ergonomic shape and lightly powdered interior make the glove easy to slip on and off. · Resistance: Its natural latex base offers high dielectric characteristics. Its thickness (1.5 mm) ensures good dexterity while offering protection up to 7500 volts of use. · Resistance: Its natural latex base offers high dielectric characteristics. Its thickness ( 1 mm) ensures good dexterity while offering protection up to 1000 volts of use. 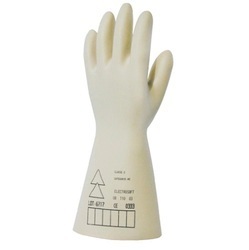 Looking for ELECTRICAL GLOVES ?